A House Filled with Happiness is what inspired me to create this blog. Before arriving in Mokpo, I was reading up on restaurants in the area. The one that caught my eye (mainly because it was Lonely Planet’s “Top Choice”) was House Filled with Happiness. Jill and I decided to check it out on day one since it was relatively close to our hotel and appeared to be a nice, cozy cafe. We felt a tad deceived after finally locating it. Lonely Planet’s Description: Housed in a colonial Japanese home, the irony of the cafe’s name will soon be forgotten when you take delight in the eclectic decor: a mix of country, modern and antique styles. It all meshes together in a cozy haze once you starting tucking into burgers, pizzas, pastas, beers and coffee. 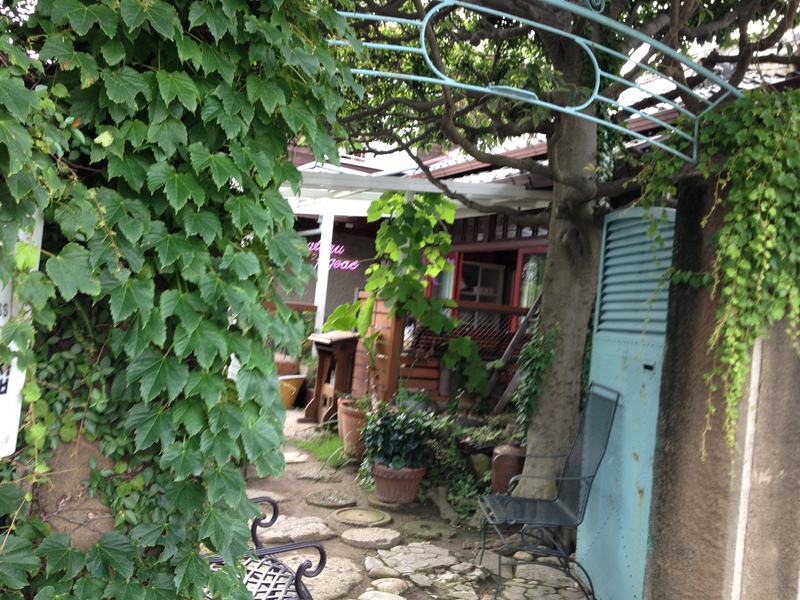 If the weather is fine, grab an outdoor seat facing the compact but verdant garden. Burgers?!! Pizza??!! BEER??!! And we can drink and eat outside in a garden. Sign me up! Ah.. it was but a gentle dream, suddenly wretchedly awoken by the sound of a IPhone alarm in the early hours of the morning. Location: On the map, it looks like House Filled with Happiness is not too far from the F1 Hotel; in fact, it is quite a walk from the hotel. I had to ballpark it because there wasn’t an exact spot located for the F1 Hotel on the map on page 222 of the Korea Lonely Planet 7th edition. However, I knew that the hotel was in the middle of the train station and the ferry, so I convinced my wife that we should walk there. Also, it would be a good chance to explore the city around us. Big mistake. First, there is not really much around the hotel. As I stated in the previous post, there is a bunch of fish markets, restaurants.. so basically a lot of fish in the area. Since Mokpo is a fishing town, this is really should not come as much of a surprise. So we walked.. and walked… and walked… Took a beer and water break outside a GS25 and then continued to walk. As we were walking, we did noticed taxis slowing down to look at us, as if to say; “Hey man, get it. Get out of this heat. You won’t find the place. But I will help you get there.” But being a stubborn man, I bit my thumb at them and continued to walk. And walk. And walk. After 30 minutes, my wife, spotted the Mokpo Modern History Museum! Success! She didn’t kill me, and finally, we are going to eat because House Filled with Happiness is right across the street! Sure as rain, it was. Quick advice: Now, gentle reader, if you don’t want to walk around aimlessly for 30 minutes like me, I would suggest just grabbing a cab and pointing to the description of the Mokpo Modern History Museum (목포 근대 역사 박물관) on page 221 of the Korea Lonely Planet. The driver will know where to go. Atmosphere and Decor: When you first arrive at House Filled with Happiness, it feels like you are breaking into someone’s house. There is no clear entrance, and I just kind of walked into the place via sliding doors at the side of the house. There was no one there. I figured this was the place, but there was a slight doubt in the back of my mind, and a fear that a drunken adjumma would burst out of the bathroom with a broomstick in hand, ready to give me the beating of a lifetime. My wife called out “Hello”. A head peaks out of the kitchen and motions for us to sit at the one of the tables. The restaurant did really match the description of the Lonely Planet. It does feel like your in someone’s house, but I wouldn’t really go as far to stay it was eclectic. To me, it felt as though I was at my great Aunt Helen’s house, who had collected newspapers for the last 40 years, and never bothered to throw anything it out. A bit of a hoarder. The garden outside was small, barely a patio and since it was hot and drizzling, we decided to take advantage of the air con. The “dining area” was a mix of bookcases, antiques and wooden tables and chairs. It was a little compact, but it wasn’t suffocating. Regardless, I was starving and would have eaten in a cardboard box at that point in time. Service: The server motioned for us to take our seats and hands up two massive menus. We open the menu and see all the culinary delights that was promised in the Lonely Planet. But before we could even glance through the menu, she looked at us, gave that oh so familiar Korean, cross-armed, “X” which means “NO!” No what? No food? She smiles and nods. The whole menu, orbiting my index finger around the closed menu. She smiles and nods. I look at my wife. She touches her stomach, which in “family speak” means: The baby and me are hungry! The server than points into a room, which is adjoined to the kitchen. She motions me to follow. My wife still sitting at the table, slipping her water, head back with eyes closed which in comparative to a Buddhist in deep meditation. Patience is running thin. I follow her into the kitchen/living room. She points to a bowl of lettuce and onions, which appeared to be covered with a transparent salad dressing, vaguely resembling Italian. She points to a tray of various breads, white, brown and multigrain rolls. She informs me this is all the food they have. Damn. At that point though, I didn’t care, I grabbed a couple of plates of “salad” and a few rolls and headed back to the table. The server poured us a couple of glasses of water. Well, at least they still have beer. I open the menu and order a Miller Genuine Draft. She does the “X” motion again. At this point in time, I had a flashback of that episode of the Simpsons, where Homer is taking care of Mr.Burns winter house and finds out there is no beer and no television, which eventually drives him to madness. I’m on the edge, and that was the tipping point. I looked at her and asked, “What exactly can I drink?” She said Guinness. Yes, a fine pint of black sludge on a warm summers afternoon. Hook me up, anything at this point in time. Jill had an lemonade. We drank our beer and lemonade in solemn silence. After about 20 minutes, it was time to get a real meal. 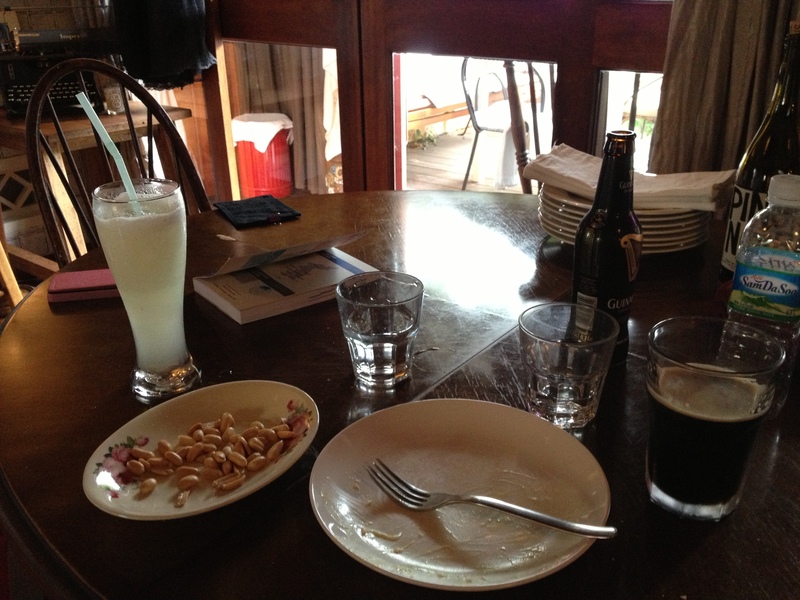 I asked for the bill which turned out to be 19k for two drinks; 10k for the Guinness and 9k for the lemonade. Value: Uhhh….. avoid this place like the plague unless A&E comes to film an episode of Hoarders. Map: Uhhh….damn near impossible to find on GoogleMaps. So, here’s a link. No you are not stalking an adjamma.. this is actually a restaurant. The salad is gone.. it wasn’t much to begin with. I would skip the House Filled with Happiness. It’s a pain to find and there is no food there. Check out The Old Man in the Sea. That was a nice little place overlooking the ocean.